Mobile App Evaluation for Agriculture Health and Safety. You are here: Home / Why We Care / Mobile App Evaluation for Agriculture Health and Safety. Mobile devices and the application software, also known as “apps”, that run on these devices are becoming ubiquitous in the general population. This is also true in agriculturally related populations. This reality has tremendous potential for improving the health and safety of individuals who work in agriculture. A plethora of apps already exist that can be used for the assessment of workplace hazards and implementation of worker protection. However, very little guidance on the use of these apps for agricultural safety and health exists. This evaluation provides a framework for evaluating apps that have potential usefulness in this area. 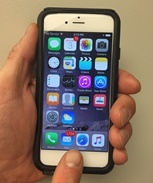 A mobile apps team (National Children’s Center, National Farm Medicine Center, Biomedical Informatics Research Center (BIRC), Farm Ranch Safety and Health Association, Langley, BC Canada, and the College of Public Health, Department of Environmental, Agricultural and Occupational Health, University of Nebraska Medical Center) has developed and tested an evaluation rubric with a simple formula to rate apps. It was tested by mobile app developers and agricultural health and safety experts. The mobile application evaluation rubric may be used to assess the content, technical performance, usability, information delivery and value of apps for use in the agricultural health and safety field. We hope this will directly benefit farming populations and strengthen partnerships among farm families, insurance companies, agricultural lenders, commodity groups and community based organizations. For additional information contact nfmcsh@mcrf.mfldclin.edu or 1-800-662-6900.